BrowserWatch is the PUP that uses misleading techniques to prevent removal. Use Reimage to locate malicious components and get rid of them faster than with uninstall instructions. A full system scan blocks virus reappearance and prevents traffic to malicious domains. BrowserWatch is a potentially unwanted program (PUP) that is widely promoted via adware programs. It’s a suspicious Google Chrome extension that promises to improve browsing security and privacy. However, this add-on created by bdata-service.com is used for generating advertising-based revenue for the developers. However, this extension might also be promoted in software bundles. It means the PUP might enter the system unnoticed. Due to this characteristic, users often refer to it as BrowserWatch virus. But it’s not the right term to describe this application because it cannot cause direct harm to your device. According to the research team from NoVirus.uk, the biggest threats are related to BrowserWatch redirect tendencies. The PUP might open browser’s tab and force users to visit highly suspicious websites, including adult-themed, illegal software download or video streaming sites. However, BrowserWatch might also redirect to tech support scam, phishing or malware-related websites. For this reason, your chances to encounter cyber threats might increase after the hijack. Additionally, your privacy might be put at risk too. The problem is that aggregated details might be shared with third-parties. Of course, usually, they are advertising networks or companies. However, some delicate details might end up in the hands of cyber criminals too. Thus, BrowserWatch removal is necessary to protect your privacy. Users are suggested to remove BrowserWatch with Reimage or another anti-malware software. However, you can also get rid of it and its related components manually. The guide at the end of the article will help you to succeed with this task. 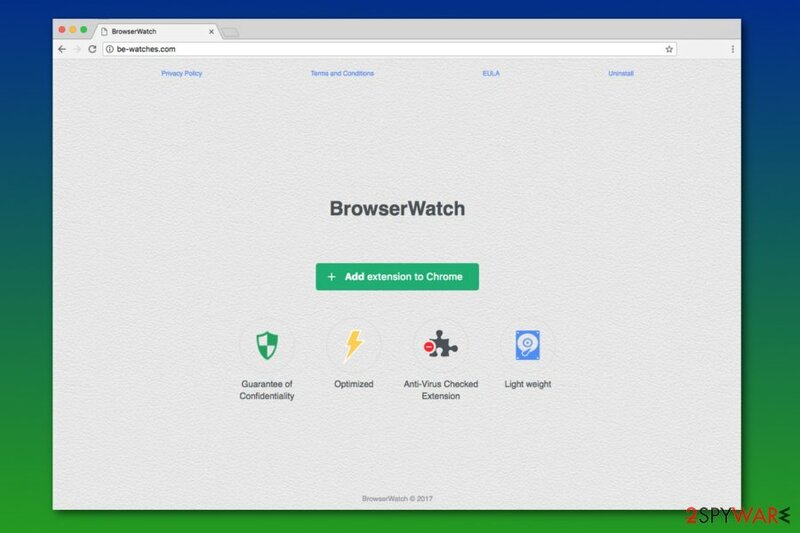 BrowserWatch is a shady Chrome add-on that is promoted with the help of adware programs. Browser Watch is available to download on the official website be-watches.com. This domain is actively advertised with the help of adware programs. Typically, these ad-supported applications arrive on the system in the freeware or shareware bundle. After the infiltration, they might alter browser’s settings and start redirects to this site. Remove ticks from pre-selected applications that are offered to download along with the primary program. 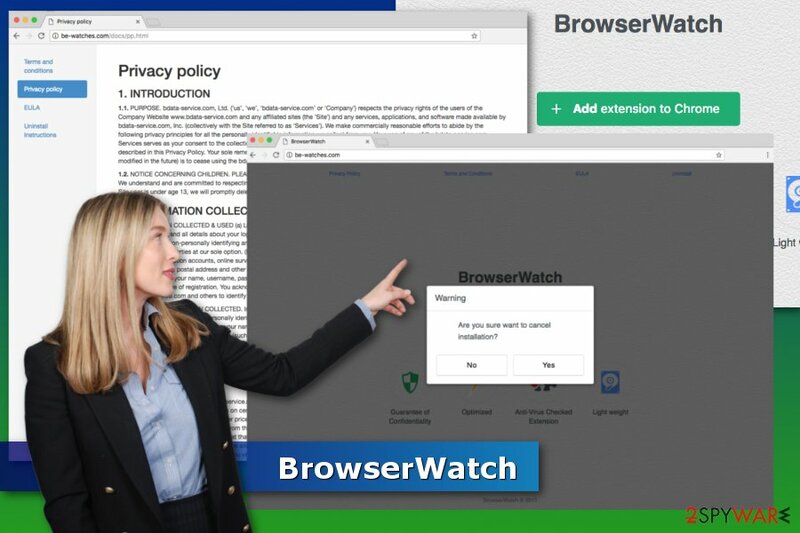 There’s no doubt that you have to remove BrowserWatch extension from the browser. Thus, navigate to Chrome’s extensions and click the Trash icon next to this entry. Additionally, look up for other suspicious applications that may have been installed without your knowledge too. However, potentially unwanted programs might also install additional components, or the same software bundle may have installed other undesired apps. Thus, you should check the list of installed programs too. To speed up this process, you should opt for the automatic BrowserWatch removal which requires scanning the system with anti-malware software. Here, look for BrowserWatch or any other recently installed suspicious programs. Check the list of installed apps and remove all the entries that might be related or came together in Mac OS X with BrowserWatch. Wait until you see Applications folder and look for BrowserWatch or any other suspicious programs on it. Now right click on every of such entries and select Move to Trash. When in the new window, check Delete personal settings and select Reset again to complete BrowserWatch removal. Once these steps are finished, BrowserWatch should be removed from your Microsoft Edge browser. Here, select BrowserWatch and other questionable plugins. Click Remove to delete these entries. Now you will see Reset Firefox to its default state message with Reset Firefox button. Click this button for several times and complete BrowserWatch removal. Open the list of Google Chrome extensions. Uninstall all questionable entries, including BrowserWatch. Then reset the browser to remove all invisible entries and tracking cookies. Here, select BrowserWatch and other malicious plugins and select trash icon to delete these entries. Click Reset to confirm this action and complete BrowserWatch removal. Here, select Extensions and look for BrowserWatch or other suspicious entries. Click on the Uninstall button to get rid each of them. Now you will see a detailed dialog window filled with reset options. All of those options are usually checked, but you can specify which of them you want to reset. Click the Reset button to complete BrowserWatch removal process. ^ Christopher Kanaracus. Google Chrome Once Again Target of Malicious Extensions. Threatpost. Security news. ^ New tech support scam launches communication or phone call app. Microsoft Secure. 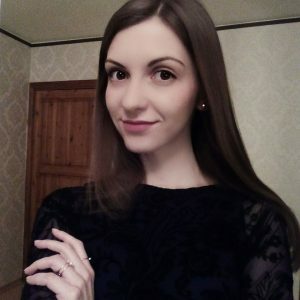 The official website. This entry was posted on 2018-02-02 at 04:10 and is filed under Adware, Viruses. You can quickly scan the QR code with your mobile device and have BrowserWatch manual removal instructions right in your pocket. How did you remove BrowserWatch?